Are you paralyzed at the thought of a first date? Do all sorts of “I’m not ready to date there’s no one out there for me anyway” excuses flood your consciousness? Would you rather sit safely behind your online persona editing witty responses to profile enquiries of potential suitors as opposed to dating them? And let’s not forget that first date fears compound the longer it’s been since you’ve dated. If this sounds like you, you may well still be single but you are certainly not alone. 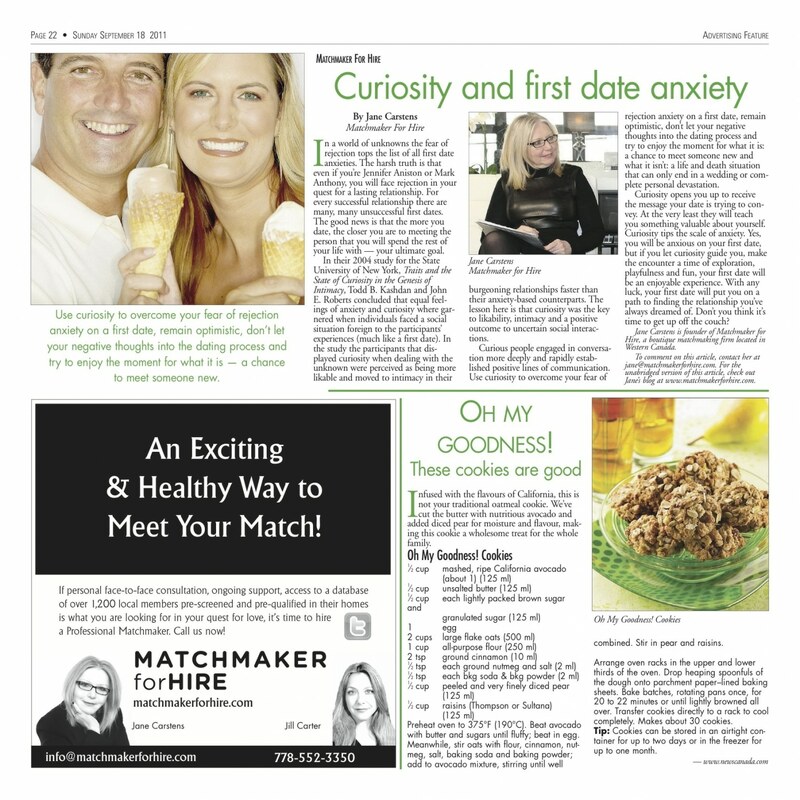 Everyone feels slightly anxious at the prospect of a first date, these feelings are completely normal, what separates the stress free first time daters from the rest of us is how they deal with anxiety. In this article we will take a look at what produces your anxiety and how you can deal with it. There are basically three main facets to dating anxiety: placing way too much emphasis on the first date, fear of the unknown, and fear of rejection. It’s easy to say that you need to place less emphasis on the first date, but in practice it’s a little harder to do. And, if you’re looking for marriage material on your first date you increase the pressure dramatically and you are most defiantly setting yourself up for disappointment. No one will fulfill everything on your marital wish list. When you’re stuck in a “marriage material” mindset every miss match on your check list will count as points against your date leading to a negative vibe that taints the rest of the encounter. Keep the first date light, don’t pin all of your hopes and dreams on a single first time encounter, relax and let the experience unfold as it will. Fear of the unknown is also a big anxiety generator. The best way to conquer this fear is to get out there and date, you’ll find the more you date the less scary it becomes. If this fear is what’s holding you back in the first place you need to do a little more homework. Visualization, a technique used successfully in the fields of medicine and professional sports is one way over come the fear of the unknown. Find a quiet place and a few 20-minute blocks of time to dedicate to this exercise over the course of a couple of days. Imagine going on a first date; visualize all aspects of this date and all the things that could go wrong. At each stage of the date and each calamity that you image befalling you, judge for yourself if these potential disasters -worrying about a lull in the conversation, am I attractive enough, who will pay the bill etc. – are really worth the paralyzing fear you experience. Another benefit of this technique is that you will now be mentally prepared to deal with each of these imagined events in a positive way before they happen. For example, an office acquaintance sets you up on a blind date. When you get to the restaurant and see him for the first time you immediately know there is no chemistry. Working out a strategy before hand, you could decide to tell him right off the bat that you don’t feel the spark, politely excuse yourself, get in your car and drive home. Conversely you could choose to enjoy a meal together and see where it leads. The worst that could happen is that you make a new friend who may have a single friend who is your Mr. Right. By far the granddaddy of all first date anxieties is the fear of rejection. The fear of rejection will keep you on the couch, behind the computer or making up excuses longer than any one thing in the dating anxiety arsenal. The harsh truth is that even if you’re Jennifer Aniston or Mark Anthony, you will face rejection in your quest for a lasting relationship. The more you date, the more rejection you are liable face. For every successful relationship there are many many unsuccessful first dates but just like first dates the more rejection you experience the easier it is to take. The good news is that the more you date the closer you are to meeting the person you will spend the rest of your life with which is your ultimate goal. In their 2004 study for the State University of New York: Traits and the State of Curiosity in the Genesis of Intimacy, Todd B. Kashdan and John E. Roberts concluded that equal feelings of anxiety and curiosity where garnered when individuals faced a social situation foreign to the participants’ experiences (much like a first date). In the study the participants that displayed curiosity when dealing with the unknown were perceived as being more likeable and moved to intimacy in their burgeoning relationships faster than their anxiety based counterparts. The lesson here is that curiosity was the key to likeability, intimacy and positive outcome to uncertain social interactions. Curious people engaged in conversation more deeply, listened to what the other person was saying more intensely rapidly establishing positive lines of communication. Use curiosity to over come your anxiety on a first date, remain optimistic, don’t let your negative thoughts into the dating process and try to enjoy the moment for what it is: a chance to meet someone new and what it isn’t: a life and death situation that can only end in a wedding or complete personal devastation. Focus on the other person, make eye contact, and really listen to their words and what they have to say. All of these techniques will increase your likeability and quickly establish a more intimate tone to the relationship you are trying to develop. Being curious opens you up to receive the message your date is trying to convey, they will, at the very least teach you something very valuable about yourself, what ever the message may be. Curiosity tips the scale of anxiety. Yes, you will be anxious on your first date. Let curiosity guide you, practice visualization, and make the encounter a time of exploration, playfulness and fun as opposed to filling a checklist, dating can be an enjoyable experience unto itself. With any luck, your “first date” will put you on a path to finding the relationship you have always dreamed of. Think it’s time to get up off the couch? upon your website and I actually enjoyed account your weblog posts. Dad It’s Time You Started Dating VICTORIA’S SINGLES EVENT OF THE YEAR!